Legacy begins with one. One person who makes a choice to fulfill a dream that becomes a legacy. Creating elegant fine jewelry is the legacy of Jay Gilbert and Coast Diamond. Creating beautiful spaces for elegant fine jewelry is the legacy of Bart Heller of Barons Jewelers. Barons is a place where you see smiling faces enjoying the Barons experience of exceptional customer service. They have served generations of customers since 1978 who return to create a legacy of their own with fine jewelry. We are so pleased to be celebrating Barons Jewelers of Dublin, CA as our Coast Diamond Retailer of the Week for the third year in a row. Jennifer Lopez is building a legacy… a legacy of diamonds! She wears them well and she wears them often. Whether enjoying a casual day around town, performing in Dubai or hanging out on a talk show, JLo wears her diamonds. The ring that shows up on JLo’s finger, no matter what, is the round brilliant diamond band. It’s versatile. It is the perfect ring to wear for every occasion. It is the perfect ring for a woman building a legacy. It is the perfect ring for you. The Coast Diamond fishtail set round brilliant diamond band comes in a variety of carats; from stand-alone to petite, and every size in between. It is available in your choice of metal: rose, yellow or white gold, or platinum. Click on the images below for full details. Create a stack with one of each color. Try it as a midi ring. Build your legacy of diamonds at Barons Jewelers where you can relax and enjoy the Barons’ experience. Congratulations to Barons Jewelers, Dublin, CA for being our Coast Diamond Retailer of the Week! For Paul Wojcik the choice to go into the fine jewelry business was fairly easy. He grew up working in his parents’ jewelry store and loved it so much he started his own jewelry store. In 1978 Nederland Jewelers opened in downtown Nederland, TX. Today there is a Nederland Jewelers in Beaumont, TX and Lake Charles, LA. as well. You can have confidence shopping at Nederland Jewelers because of their long-standing diligence to their customers. As they celebrate 40 years in the fine jewelry business, it is our pleasure to choose Nederland Jewelers as our Coast Diamond Retailer of the Week. When buying an engagement ring there are choices that may surprise you. 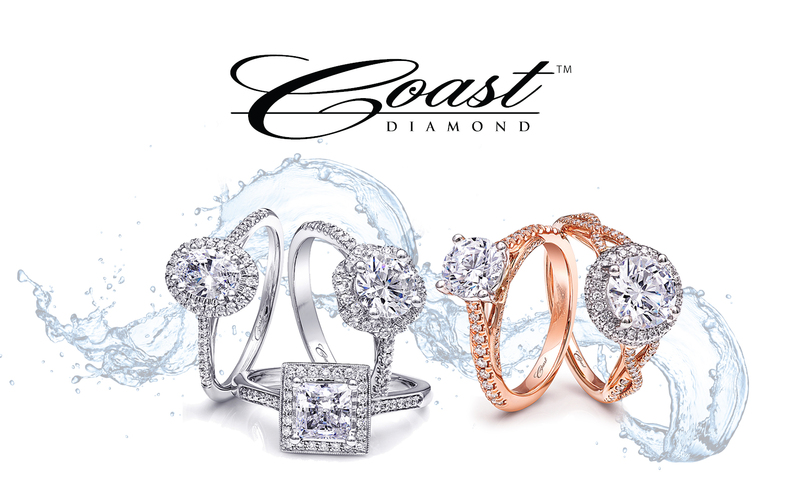 Our Coast Diamond rings are completely customizable. That means the design you choose becomes completely personalized when you make these three choices. The Coast Diamond one carat oval halo engagement ring (LC10233) is an elegant and delicate ring set in white gold. This ring and all our Coast Diamond engagement rings come in your choice of white, yellow or rose gold or platinum. Or you can mix metals. Scroll over each ring below for details. The Coast Diamond six-prong solitaire engagement ring (LC5386) is a petite design with prong set diamonds down the shoulders. The solitaire engagement ring design can be personalized with any shape center stone. What is your favorite shape? Today’s most popular bridal jewelry trend is unique diamond wedding bands. This Coast Diamond band (WC10155H) with alternate hexagon and square shapes suits the diamond band trend to perfection. The unique decorative details and milgrain edging of this band paired with your engagement ring is fabulous. Stack it with other Coast Diamond bands for an amazing and truly personalized wedding set. For over 100+ years Barmakian Jewelers has been providing luxurious fine jewelry to their customers in New England. At Coast Diamond, we have celebrated Barmakians for their exceptional shopping experience, both online and in-store. We continue to celebrate Barmakians for their commitment to the community through The Home for Little Wanderers, Boys and Girls Club of Greater Nashua and The Make a Wish Foundation. This week we celebrate them for helping you celebrate life’s special moments with the luxurious gift of exceptional diamonds. Once again, it is our pleasure to call Barmakian Jewelers of Framingham, MA and Nashua, NH our Coast Diamond Retailer of the Week. Did you know? Barmakian Jewelers is one of six retailers in the United States to be named an Argyle Pink Diamond Select Atelier. These intense pink diamonds from Australia are very rare and truly magnificent. Watch the video below to learn more about the Argyle Pink Diamond. And watch their diamond teaching series on Instagram at #BarmakianDiamonds to learn more about diamond center stones. The Argyle Diamond Mine is located in Western Australia. The Argyle Diamond Mine is the largest producer of pink diamonds, producing 90% of the world's rare pink diamond supply. To put this in perspective, the annual production of the intense pink diamonds, weighing over just a half carat, would fit in the palm of your hand. In 2015, Barmakian Jewelers was nominated into the exclusive group of Argyle Pink Diamond's Select Ateliers. @argylepinkdiamonds_official Our diamond experts love to teach! We hope that our diamond series will help you feel ready to pick out the perfect diamond for you. Be sure to follow the hashtag #BarmakianDiamonds to see all of our diamond videos. Is the Argyle Pink Diamond your choice of center stone for these luxurious Coast Diamond engagement rings? Coast Diamond’s two-carat engagement ring (LJ6023) features over 1.5 carats of fishtail set diamonds in two rows on the band of the ring. The matching wedding band (WJ6023) is just under one carat of diamonds (0.96CT). That is 4.5 carats of diamonds on her finger. Now, this is luxury! When diamonds intertwine around a 1.5-carat center stone, to create this unique Coast Diamond halo engagement ring (LC5449), it is the ultimate in elegance. As for luxurious… It simply speaks for itself. The Coast Diamond Ultimate Wedding Band (WZ5001H) is the perfect gift for her for any occasion. It is 0.75CT of round brilliant diamonds she can wear by itself, in a stack of diamond bands or paired with her engagement ring with the Argyle Pink Diamond center stone. Congratulations to Barmakian Jewelers for being our Coast Diamond Retailer of the Week! There is a little more than a week until Mother’s Day. Coast has the best place for you to find luxurious gifts for the moms in your life… Grebitus Jewelry and Fine Gifts in Northern California. With a beautifully curated collection of jewelry and gifts, you will find just the right present for your mom – the mother of your children – that special person that has always been “like a mom” to you. You may even want to shop for yourself. From diamonds to watches, with fine gifts from local California designers and artisans from around the world, Grebitus Jewelers’ trained and friendly staff will help you find the perfect gifts. This week we are happy to honor Grebitus Jewelry and Fine Gifts of Sacramento and Fulsom, CA as our Coast Diamond Retailer of the Week. She is trustworthy, dependable and committed. This beautiful Coast Diamond band (WC20021C-S) is the gift that says it all. Blue is the color of loyalty, trust and strength. Mom will wear this ring, that features fishtail set diamonds and sapphires, knowing she is adored. The most popular and versatile band for stacking, this Coast Diamond petite pavé diamond wedding band (WC5191H), finished with milgrain edging, is precious within a stack of bands, on its own, or next to virtually any Coast Diamond engagement ring. This band is available in a variety of carat sizes, from 0.08-0.72 carat. Her favorite color is blue and this Coast Diamond pavé set diamond and sapphire ring (WC7040-S) is the perfect gift. The smooth lines of this high polished fashion ring are finished with milgrain edging for a classic touch. ♥The most exciting thing about our diamond bands… They are available in your choice of metal: white, rose, or yellow gold, or platinum. Congratulations to Grebitus Jewelry and Fine Gifts for being our Coast Diamond Retailer of the Week!